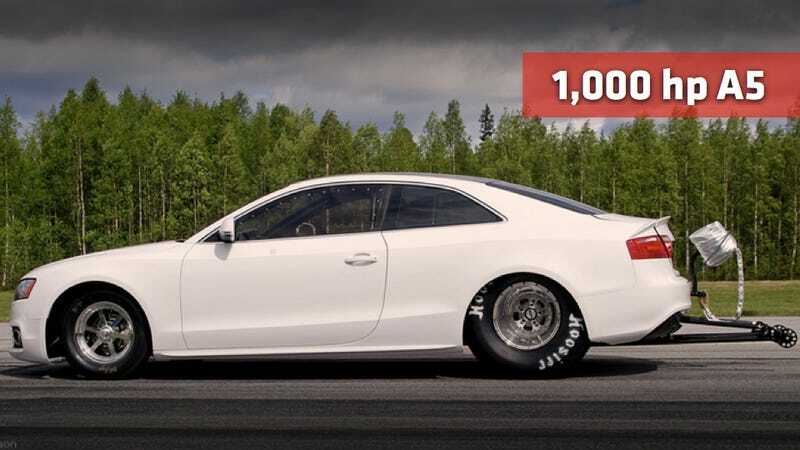 Sweden's Jens Eklund has been sending huge-horsepower Audis down drag strips since last decade. His latest car stands out for its mind-twisting mashup of the A5's lithe form with that typically hand-made muscularity of a drag car. The result? Awesomeness writ huge. Eklund's domain is that of 1000-hp, turbocharged 5-cylinder monsters, like his previous S6. He's apparently kept that powertrain strategy intact with the A5. Indeed, there's not much of the original A5 left in his dragster, save for the body panels. But if you're interested, all those extra parts left over from the donor car are for sale. Leaf through the photo gallery and see what it takes to turn a luxury coupe into a quarter-mile (or is that 0.40 kilometer?) monster.